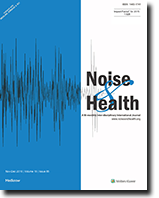 This study investigated the effect of chronic workplace exposure to excessive noise on sleep quality. It involved 40 male workers aged 33 to 50 years, 20 of whom had been exposed to environmental workplace noise levels of 85 dB or more on 40-hour-a-week jobs. Another 20 workers who were not exposed to excessive noise were used as controls. All subjects were interviewed and submitted to physical examination, pure tone and speech audiometry, immittance testing and nocturnal polysomnography. Comparative analysis demonstrated that the two groups were similar, except for the exposure to noise. Fisher's test comparison of pure tone and speech audiometry and immittance testing revealed mild to moderate noise-induced hearing loss ( P <0.001) in the ≥ 85-dB group. Indicators of sleep continuity were abnormal in both groups, demonstrating poor sleep quality; however, sleep quantity was normal. Of the 40 individuals, 13 (32.5%) presented respiratory sleep disorders. Of those 13, 10 presented daytime somnolence according to the Epworth Scale. The Mann-Whitney test showed that sleep was identical in the two groups. Fisher's exact test revealed no association between altered sleep and hearing status in either group. Our results show that active men working 40-hour-a-week in the presence of excessive noise without adequate protection for more than eight years presented with noise-induced hearing loss but their quality or quantity of night sleep was unaffected. Sensori-neural deafness may represent an element of adaptation against noise during sleep. This study investigated the occurrence of hearing loss among workers of a petrochemical industry during a period of five years. The records of environmental noise and solvents measurements and the results of annual audiometry performed by the company were examined. The audiometric results of workers from olefin operational areas 1 and 2 and aromatic plant areas exposed to solvents and noise and utility area workers exposed only to noise were analyzed for the standard threshold shift (STS). Despite the low exposures to solvents and a moderate exposure to noise, 45.3% of workers had hearing losses and 29.6% had STS. The most common complaint among individuals with hearing impairment is the inability to follow a conversation when several people are talking simultaneously, a noisy listening situation which is completely different from the quiet surrounding of the conventional pure tone audiometry used as basis for the hearing aid settings. The purpose of this report was to present important characteristics of the BeneFit Method (BFM), a procedure that fits the hearing aid under simulated conditions of competing speech and also a clinical pilot evaluation study comparing the BFM to the NAL-R recommendations and also to the Logic procedure, a GN resound proprietary fitting algorithm representing a modern digital hearing aid fitting procedure. Speech recognition scores in noise (SRSN) using monosyllabic words presented under different background noise levels were evaluated on 21 randomly selected subjects with hearing impairment. The subjects were fitted with the same type of hearing aid Danalogic 163D according to the BFM procedure as well as the logic procedure, the latter developed and recommended by the manufacturer. A comparison of the SRSN when using the subjects' current hearing aid fitted according to the NAL-R procedure was also made. 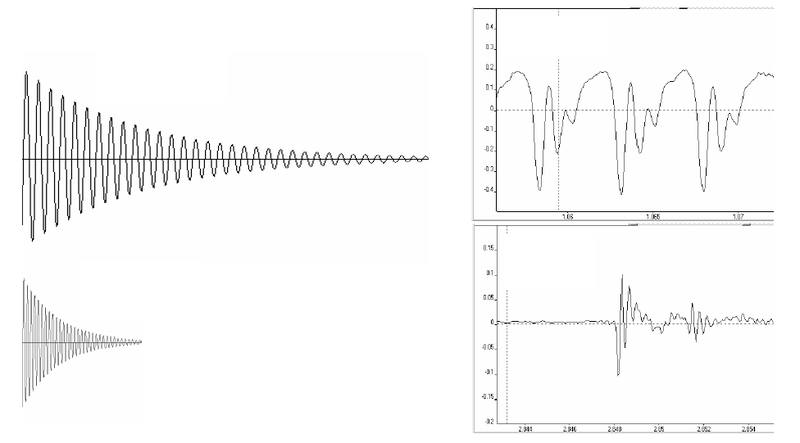 Only the BFM procedure provided a significant SRSN improvement compared to the unaided condition (P< 0.01) in a signal/speech-noise level of 75/65 dB corresponding to a normal cocktail party condition. Moreover, patients performed significantly higher SRSN when fitted according to the BFM, than when fitted according the Logic or NAL-R procedures. The BFM procedure, which is based on individual and functional detection of hearing thresholds in noise levels corresponding to a cocktail party condition, can improve SRSN significantly. Hearing aids should be fitted under conditions similar to those when the hearing disability is perceived the most, i.e., in an environment with background noise. Both the antioxidant, n-l-acetyl cysteine (L-NAC) and the Src inhibitor, KX1-004, have been used to protect the cochlea from hazardous noise. To date, KX1-004 has only been used locally on the round window. In the current study, the two drugs were administered systemically. LNAC was delivered intraperitoneally at a dose of 325 mg/kg while KX1-004 was administered subcutaneously at a dose of 50 mg/kg. The noise exposure consisted of a 4 kHz octave band of noise at 100 dB SPL for 6 hours/day for 4 days. The drugs were administered once each day, 30 minutes prior to the onset of the noise exposure. The animals' hearing was estimated using the evoked response records from surgically-implanted chronic electrodes in the inferior colliculi. Animals treated with LNAC and KX1-004 had from10 to 20 dB less temporary threshold shift at day 1 and an average 10 dB less permanent threshold shift by day 21 when compared to control saline treated animals. There were no significant side effects (i.e. : appetite loss, weight loss, lethargy, etc.) related to either of the drug treatments. 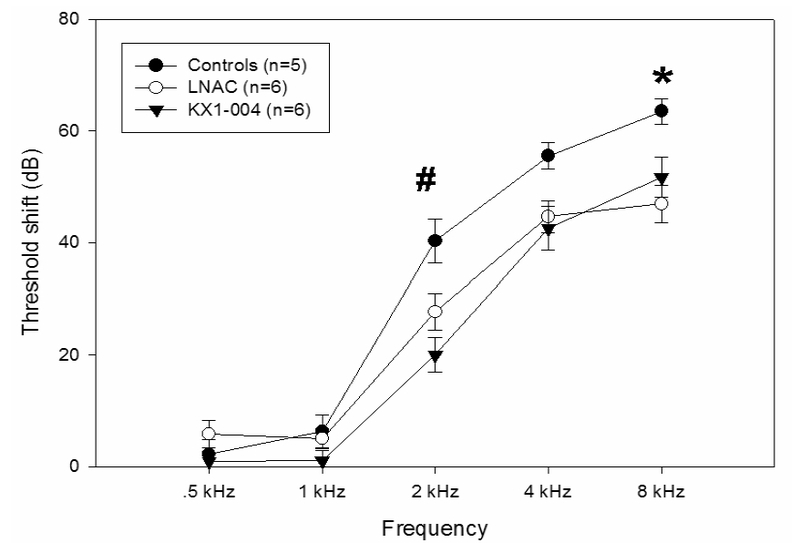 KX1-004 produced at least as much protection as L-NAC, but at a significantly lower concentration. Aircraft maintenance workers are exposed to a mixture of solvents in the presence of intermittent noise. For this study these workers exposed to solvent mix and noise, were compared with mill workers exposed to noise alone, printed circuit board operatives exposed to solvents alone and those exposed to none who acted as controls. Tympanometry, acoustic reflex thresholds, transient and distortion product otoacoustic emissions, auditory brainstem potentials, nystagmography, and posturography were examined. 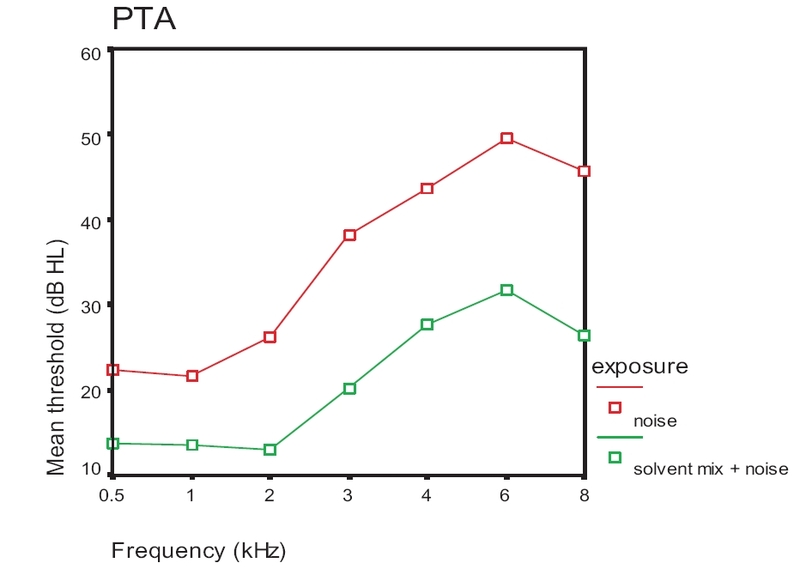 There was a significant effect on pure tone thresholds for both noise and solvents+noise. 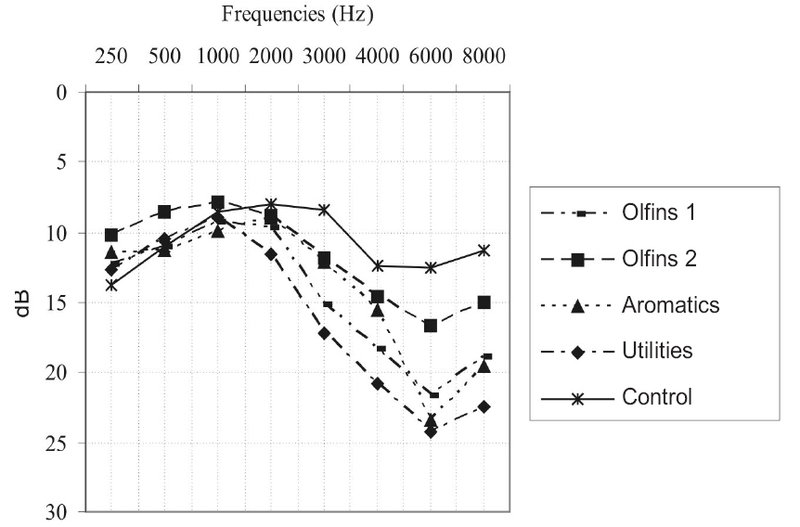 The distortion product otoacoustic emissions declined with frequency and exhibited lower DP amplitude with noise compared to solvents and noise group. The transient emissions showed a similar effect. Over 32% of subjects with solvent and noise exposure had abnormalities of the auditory brainstem responses in terms of interwave interval prolongation. The mean acoustic reflex thresholds showed a pattern of differences which differentiate noise from solvent and noise groups. The contralateral pathway appears to be differentially affected by solvent exposure. 32% of subjects in the solvents and noise group had an abnormal posturographic finding. In the solvents and noise group 74% had abnormalities of saccades, 56% of pursuit and 45% of optokinetic nystagmus.